Hey there. Recently, it's been tough getting my horror film fix on. Young eyes are everywhere recently and I don't want to expose the kids to anything that they shouldn't see. I mentioned to kids the other day how I used to watch "scary movies" with my dad when I was a young boy. Great films such as The Fly and cult classics such as Phantasm. lol I remember being 6 or 7 and lying in bed late at night watching those kind of films with him. I understand the sentiment behind his actions. He very well just wanted to share a hobby of his with his young son. However, being a father myself, I'm not so sure that was the best idea you had, Dad! lol Nevertheless, my love for horror started right then and there and though I would love for my kids to catch that bug, I wouldn't make them sit through some of the stuff I see. Especially something like High School of the Dead. Here are my thoughts on... High School of the Dead. Fan service. And man... is there some heavy fan service scenes in this show. For those of you not familiar with the term, fan service are scenes the focus is on the "goods" of a female character. Naturally, fan service is geared towards the male audience and many series/films that offer fan service have female characters with an exaggerated buxom or wearing really short skirts that will offer an opportunity to flash the audience. HOTD makes no effort in hiding it. The female characters are all wearing short skirts and the female nurse that accompanies the crew is of the exaggerated buxom variety. The first few episodes will other hint at fan service, but once you get to the later episodes, they lay it on pretty thick. Before you write this off as an eye candy show with blood and guts, you realize that the characters start to develop nicely. All the characters have a back story that fuels their desire to survive. Whether it be to protect the girl you loved since forever or to fight back against all that have put you down all your life. The development of the characters is a nice surprise amid all the chaos. It reminds me very much of the way The Walking Dead developed their characters and now that I'm thinking about it... It's pretty similar to a Left 4 Dead game. The characters need to find means to survive and rely on each other's skills to make sure they do. 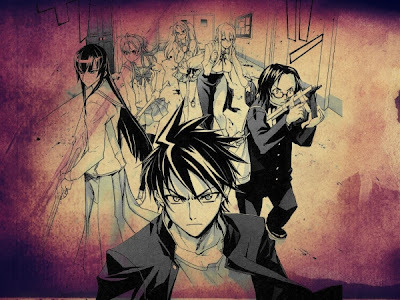 High School of the Dead is exciting. The problem that this show has is the fan service. If they were to cut that out to a minimum, this show could have been great. It goes for a more deep, character driven zombie horror series but falls short. With all the fan service that goes on, you just can't take this show seriously. Right when you find out a deep, emotional secret concerning a character, fan service pops up and kills any emotional connection that you could have had with the characters. 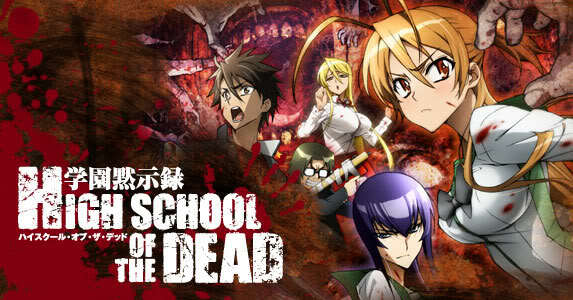 Don't get me wrong, High School of the Dead is definitely worth a look. It's just that you need to look past all the pretty girls to find the gem that is a great story line. Later! This is an interesting movie.. I'm a fan of Anime's and Horror movies.. I will try to look for a copy of this.